Dylan Robertson WP, Connor Kleis 5 inning save. Lane O'Dea 3-3, HR. Lane O'Dea WP, complete game, 2-2, 3 RBI. Chase Grant 2-2, Jordan Pearce and Rob Simsiman 2 RBI apiece. Rob Simsiman WP, Matt Mullen save. Connor Kleis 3-3, HR, 2 RBI, Chase Grant and Rob Simsiman 2 hits apiece. Matt Mullen WP, Jordan Pearce save. Jordan Pearce 3-3, 2 HR, 6 RBI. Connor Kleis WP, Lane O'Dea save. 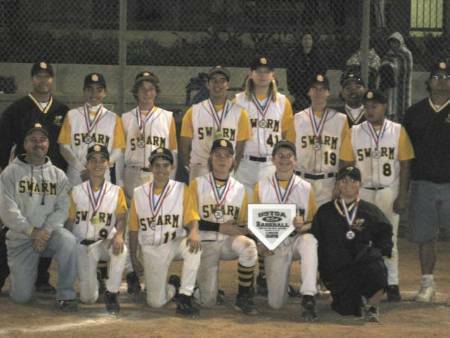 Swarm finish 6-1 and finish as Ultimate Division runner-ups in 2010 USTSA World Series. 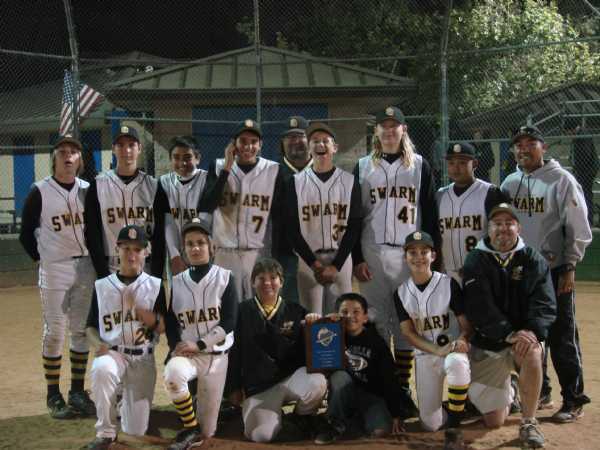 The 13U San Diego Swarm finished their 5 game weekend in Huntington Beach with a second place finish. 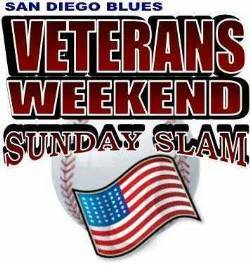 Included in their run Sunday were wins over Team Victory 6-1 (Connor Kleis WP) and the Oakley Stingrays 4-1 (Jordan Pearce WP). The Stingrays are the top rated 13U team in the US and that win was especially exciting. Jordan pitched a masterful game, striking out 14 and becoming one of the very few pitchers anywhere to defeat the Rays. The Swarm will return to action the first week of May. Congrats to all members of the team this weekend...Jordan, Connor, Josh Fitzgerald, Rob Simsiman, Dylan Robertson, Lane O'Dea, Dillon Wirkus, Nico Holm, Andrew Boyd, Jake Wiegand and Ryan McClure. Great job boys! Swarm defeat the Aces 4-1 in first pool game. 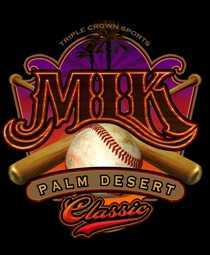 Connor Kleis, Jaylon King and Jordan Pearce (WP) hold Aces to 3 hits, 1 walk and chalked up 10 K's. Swarm defeat the Nighthawks 7-2 in third pool game. Dillon Wirkus (WP) pitches complete game with 8 K's and only 2 BB's. Rob Simsiman goes 4-4, 2 RBI. Swarm go 3-0 in pool play and earn #2 seed. Swarm defeat Valley Cats 9-1 in semifinal game. Connor Kleis pitches complete game for the win. Sluggers defeat Swarm 8-7 in final. Swarm go 4-1 and earn runner-up trophy. Thanks to Nico Holm, Andrew Boyd, Jake O'Connell and Jake Wiegand for coming out to play this weekend with the team! The 13U Swarm took the field with purpose this weekend capturing the USTSA "Ring In The Season" Championship, qualifying for the USTSA World Series. 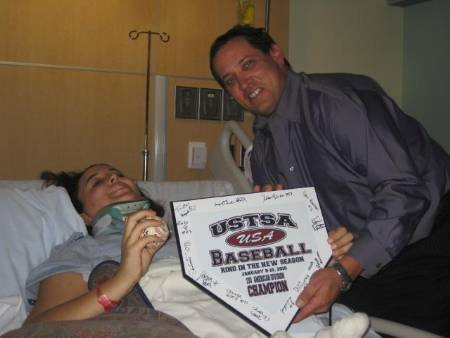 The Swarm dedicated the championship to Valerie Davis, daughter of San Diego Blues umpire Tom Davis, recovering in the hospital from an automobile accident. The Swarm presented to Valerie the signed championship trophy and game ball. The entire Swarm family wishes Valerie a speedy recovery. After going 2-0 to capture the top seed, the Swarm defeated the OC Heat 12-5 and then shut out the Victory Athletics 8-0 to win the championship. Jordan Pearce led the way with an amazing tournament. At the plate, Jordan went 9-10 with 2 BB's in 12 plate appearances, flying deep to the fence in right the only time he was retired. He scored 8 runs, drove in 9 and had 7 stolen bases including stealing 2nd, 3rd and home in one sequence in the championship game. On the mound, he pitched 7 innings (a save in game 1 and a complete game win in the finals), giving up no runs, 2 hits, no walks and registering 14 K's. He added 3 highlight reel plays at short to complete his weekend. Great tournament Jordan! Dylan Robertson, Dillon Wirkus and Connor Kleis earned the other three wins, with relief work from Jordan, Josh Fitzgerald, Rob Simsiman and Lane O'Dea. Tristan Sizik had an all around tournament, laying down bunts, stealing bases and playing 3rd, 1st, LF and RF flawlessly. Offensively, the 2-7 hitters (Chase, Jordan, Josh, Connor, Jaylon, Dillon)were absolutely dominate. In addition to Jordan, Josh had 8 hits, Dillon and Jaylon King 7 hits, Chase 6 hits. As a group, they went 40-57 (a .701 average!) with 30 runs scored, 30 RBI and drawing 9 walks. WOW! The Swarm are back in action January 16-18 in the USTSA MLK Weekend tournament in Poway. Come out and see the team. By virtue of their play in this weekends' Triple Crown Sports Christmas Qualifer, The Swarm 10U and 13U teams qualified for Triple Crown Sports' national championships - World Series in Steamboat Springs, CO and Fall Nationals in Henderson, NV. The 10U team completed the weekend with a 2-2 record and a birth in the championship game. In the finals, the Swarm lost to the Maddogs (the only team to defeat the Swarm in the tournament). 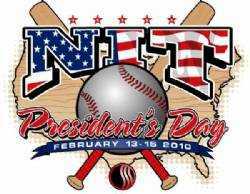 The 13U team completed pool play as the #1 seed. 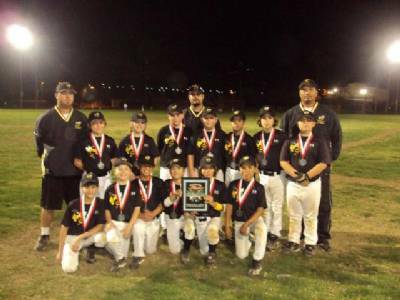 In the semi-final game, the Swarm fell one run short in a hard fought battle with the Chula Vista Warriors. The Swarm took their #1 seed into Monday and won the championship by defeating the So. Cal Aztecs in the semi's 12-2 behind Dylan Robertson's complete game and then defeated the Ramona Rattlers 14-4 in the final. The game was put away when Jordan Pearce smashed a grand slam HR, his second of the game, in the fourth. The Swarm look to take this momentum to Beaumont when they enter the PSSG tournament December 5-6. The 13U Swarm advanced as the #1 seed to the finals of the Baseball ASAP Pre-Thanksgiving tournament with back to back shutouts on Saturday, defeating the SD Eagles 7-0, then the RB Warriors 16-0. Josh Fitzgerald went the distance in game 1, giving up only 3 hits and 1 walk in his 7 inning complete game. Connor Kleis pitched a rule shortened 3 inning shutout in game 2, giving up only 1 hit and 1 walk in his complete game victory. Offensively, Chase Grant homered in each game, going 5-8 with 5 RBI to lead a potent offensive attack. The Swarm play the semi-final game on Monday, November 23 at 5PM in Lakeside. The tournament championship game is at 7:30 PM. 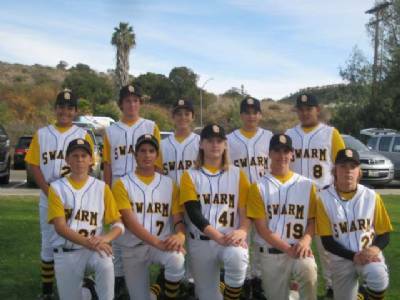 The 13U Swarm finished in 2nd place in a 3-2 pitcher's duel against the San Diego Hustle. 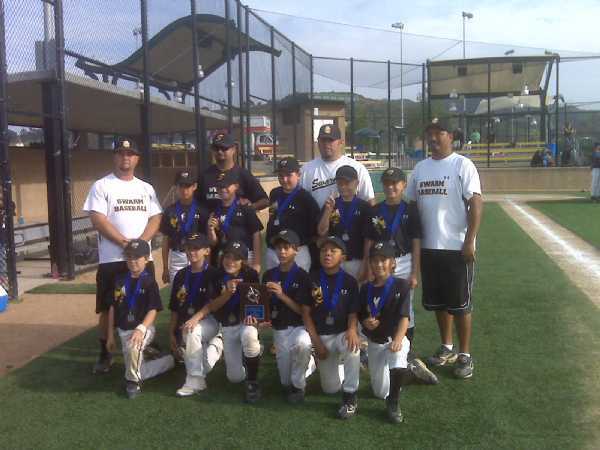 The 10U Swarm finished in 2nd place to the 11U Ramona Recon in the 11U division. The San Diego Swarm open tournament play for the 2010 season by entering the San Diego Blues' San Diego Open. 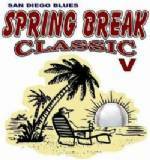 The 13U Swarm avenged an earlier loss in pool play to defeat the San Diego Cyclones and win the Championship. The 9U Swarm played well enough to have the second best record after pool play. The Swarm, however, finished in 3rd place based on tie breakers. Everyone looks forward to another Swarm season.